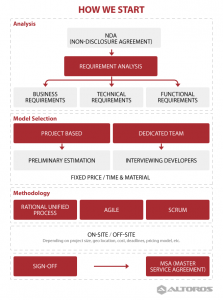 We strive to make this profitable for your organization and for Altoros, and take a super-flexible approach that often includes a mix of models across several projects. The most beneficial engagement model can be defined by a number of essential criteria, including the size of your project, geographic location, typical pricing model, etc. 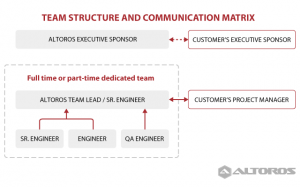 Based on these and other parameters, we will help you create the most efficient team structure and choose what type of collaboration will be the best fit. We are focused on the needs of software companies and start-ups, and can easily support them starting with a small team and then growing seamlessly over time. During 10+ years, Altoros has played a key role in helping companies create over $500M of enterprise value and raise $120M+ in venture funding. We have built a 250+ strong, full-time team across ten locations (California, Massachusetts, Norway, Denmark, Finland, Sweden, Switzerland, the UK, Argentina, and Eastern Europe) to stay closer to our customers. 91.5% of our team members are senior or mid-level software engineers and project managers that can work both onsite and offshore—depending on your project needs.